Over 300 models - infinite solutions. And we find always the best solution. baking, roasting for various industrial sectors. Vescovi System: the heat that preserves the сhurches’ heritage. and our solutions dedicated to the livestock. to meet the demands of the national and international markets. 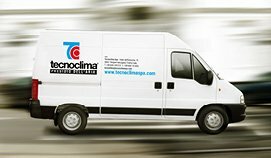 tecnoclima&reg; leading company for heating, air conditioning, air treatment. and certified internationally and sold worldwide. A wide range of products that counts more than 300 models finds application in the most varied sectors. From the heating, conditioning and air treatment of industrial warehouses, logistics warehouses, shopping centers and multi-purpose centers, places of worship, sports and entertainment facilities to a division specialized in heating of environments for agriculture, livestock, poultry and pig farming. The division dedicated to the air treatment for process, such as high-temperature technological processes, drying, painting shops, polymerization is particularly important for the company. The company has a network of qualified technical assistance centers that ensures timely and high-quality interventions. The agents have a very important role to bring tecnoclima closer to the customers in Italy and in the world. Updated on all the news that tecnoclima offers, they are always available for the customers to suggest the best solution for each project. Important agreement for the supply of warm air heaters for greenhouse heating in northern Egypt.